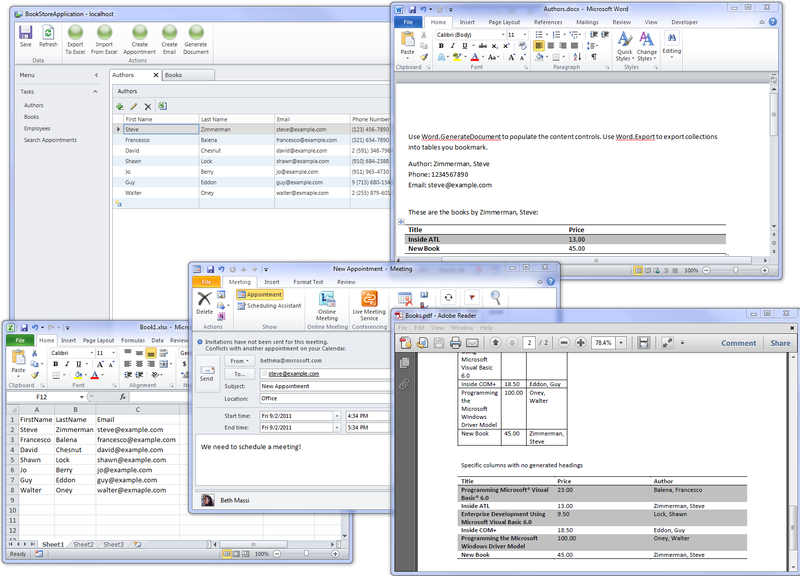 A LightSwitch Extension that provides integration capabilities with Microsoft Office 2010. The Office Integration Pack is a LightSwitch extension that makes it easy to manipulate the 2010 versions of Excel, Word and Outlook in a variety of ways common in desktop business applications. Create documents, PDFs, spreadsheets, email and appointments using data from your LightSwitch applications. Please download the Office Integration Pack Sample and review the documentation for information on how to use the Office Integration Pack. The Office Integration Pack is an open-source project on CodePlex. You can download the source code for this extensionhere. We are actively developing new features and welcome the community to help! The following prerequisite is required in order to use LightSwitch extensions. Download the OfficeIntegration.vsix file to your local machine. Launch Visual Studio and open a LightSwitch project. In Solution Explorer, double-click Properties to open the Application Designer. On the Extensions tab, enable the Office Integration Pack extension. Download the Office Integration Pack Sample for an extensive sample demonstrating the extension. Documentation is availablehere.